Pajama pants are one of the most comfortable pants that are ideal to wear at night. They are usually made of soft cotton or jersey fabrics. The construction and method of stitching a pajama pant can be found here. Pajama pants require about 2 ½ metres of cloth and are usually stitched with non transparent materials. 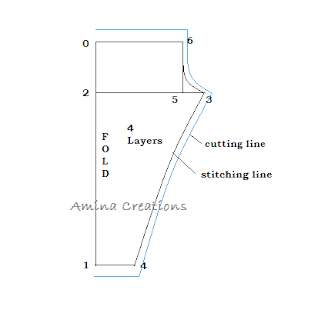 For more tutorials on how to stitch various Indian garments visit the Dress designs page. 2 to 3 = 1/4 hip + 4"
Once the measurements are marked, cut the cloth (all four layers together) leaving 1” allowance along 3 to 4 curve, ½” along 3 to 6 curve and 2" at the top and bottom. Now the two leg parts are cut and ready.The extra cloth along the top is for inserting an elastic or draw string. The extra cloth at the ankles has to be double folded so that it stays firm. Once the two pieces are cut and ready, first start by double folding the extra cloth near the ankle band of one leg piece inwards and stitching on top. In the same way stitch the ankle band of other piece as well. Then take one leg piece, fold and stitch it together in the reverse along the 3 to 4 curve. Do the same thing with the other leg as well. 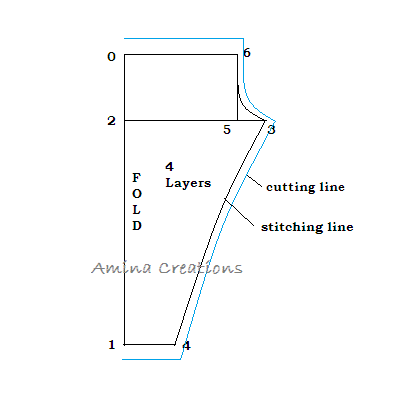 Then join the two leg pieces by stitching along the along the 3 to 6 curve in the reverse. Double fold near the waist and leave an opening in the middle if you are inserting a draw string. If inserting an elastic, place it between the fabric folds and stitch such that it is not visible. Finally finish the pajama pants by overlocking the extra cloth on the reverse to prevent thread from coming out. Turn to the correct side. Your pajama pant is now ready. 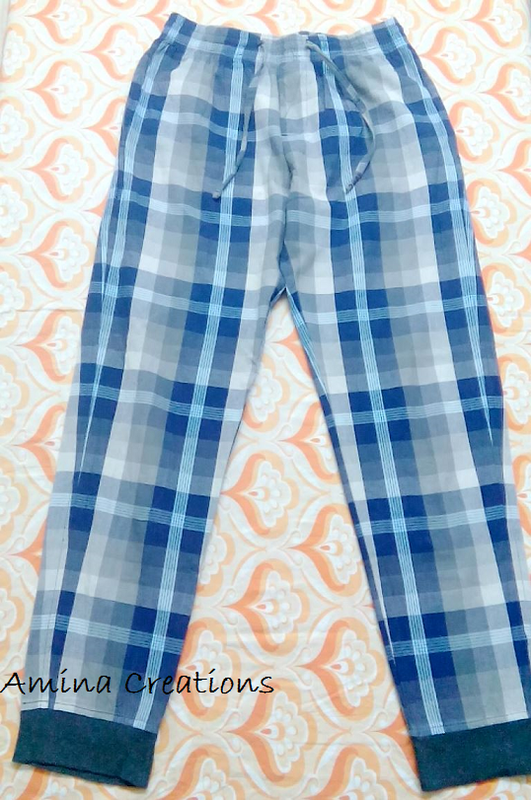 1 to 4= half round ankle + 1"
And to add more look to the pajama pant, you can use another fabric of matching or contrasting colour to stitch near the ankles as shown in the first image. Experiment with colours and fabrics and also make a matching top to wear with the pajama pants. A tutorial on how to stitch a top will be posted soon.